These roasted chickpeas are so delicious. Whip them up for a quick snack, add them to any salad for flavor and crunch, or blend them together in your food processor with a little olive oil for a perfect vegan party dip. This recipe is to taste, so feel free to adjust the amounts of the seasonings or omit the cayenne if you're not a fan of spicy foods. Add all of the ingredients to a large saucepan and mix well. Cook on medium-high heat until the flavors are blended together and the chickpeas are hot, 5 to 7 minutes. Taste to ensure that the flavor is right, adjusting any seasonings as necessary. 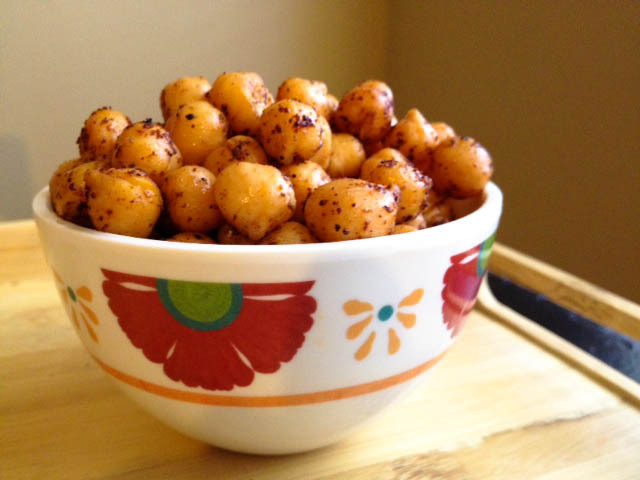 These chickpeas look so delicious, I could imagine myself polishing off the entire bowl! I love the sound of the flavourings you have used in them.